Orlando has always been on my top 5 list of places in the world I would like to travel to, ever since I was a little girl it has been somewhere that I have desperately wanted to go to- I was definitely a Disney mad child and always used to ask my Mum if we could go, but for various reasons it wasn’t something that ever happened. Fast forward to becoming a Mummy myself and I knew that one day we would just have to take our children there, not only for Disney but for all the other wonderful things that Orlando has to offer. I have been lucky enough to visit Miami before on a four day stopover after our honeymoon to Mexico, but never Orlando itself. A few months ago I got an email in my inbox which literally made me jump for joy and then burst into tears. 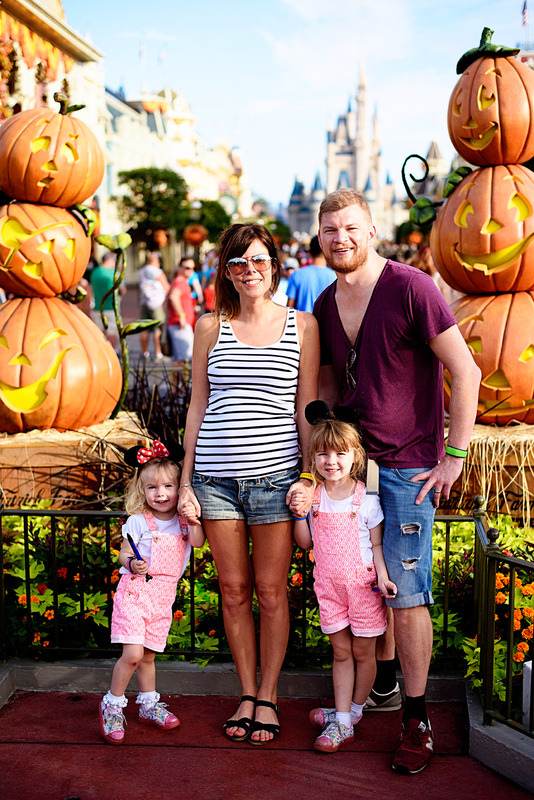 A couple of months previously I had chatted to Thomson Holidays at the Blogtacular conference and I received a lovely and incredibly exciting email asking if our family would like to go and see Mickey Mouse. To say that it was one of the most exciting emails I have ever received is an understatement and a half. 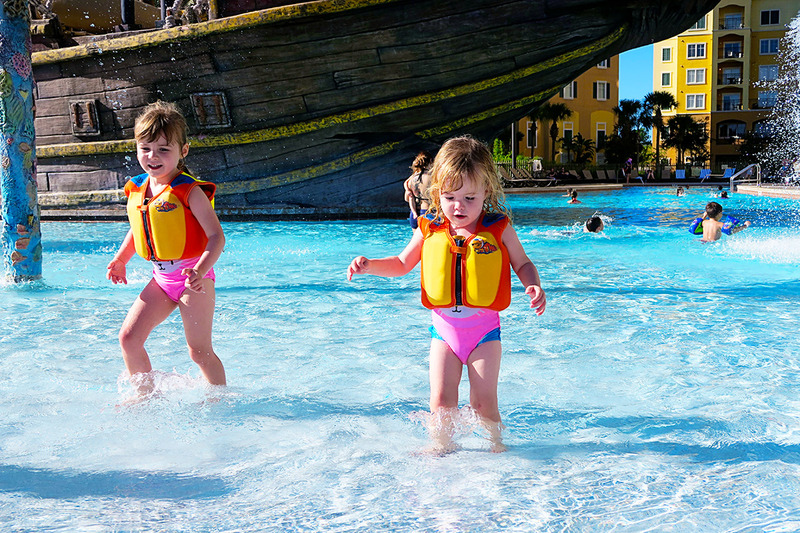 Thomson are a brand I have used for holidays many times over the years but if I am completely honest I didn’t even realise that they flew to Florida so we were really interested in the whole experience from start to finish. So soon it was all booked and we were counting down the days until what quite simply was the trip of a lifetime for us. I have taken so many photos that I thought the best thing would be to split my posts into three- two parts and then one dedicated Disney post too. We flew on an early morning flight from Gatwick to Sanford International on Thomson’s Dreamliner plane. I am not a plane fan, in fact flying makes me quite anxious, but I think I have had the nicest flight I have ever had on the Dreamliner. We were lucky enough due to space on the flight to have been upgraded to Premium and it was just quite literally a dream. There was lots of leg room and the food was delicious and although the nearly nine hour flight went quite slowly for me, it was actually as pleasant as it gets I reckon. The Dreamliner has lots of benefits, such as bigger electronically dimmed windows, bigger cabins, and a smoother ride. The plane is going to be flying from Stansted shortly which is exciting as it is my nearest airport. The girls were as good as gold on the flight, with two separate ladies commenting afterwards how great they were- this made me so proud. Arrival at Sanford Airport and getting through customs was smooth and straightforward, as it is a lot smaller than Orlando International it meant we didn’t have the queueing and we were quickly through and picking up our hire car. After that it was a 45 minute drive to our hotel. 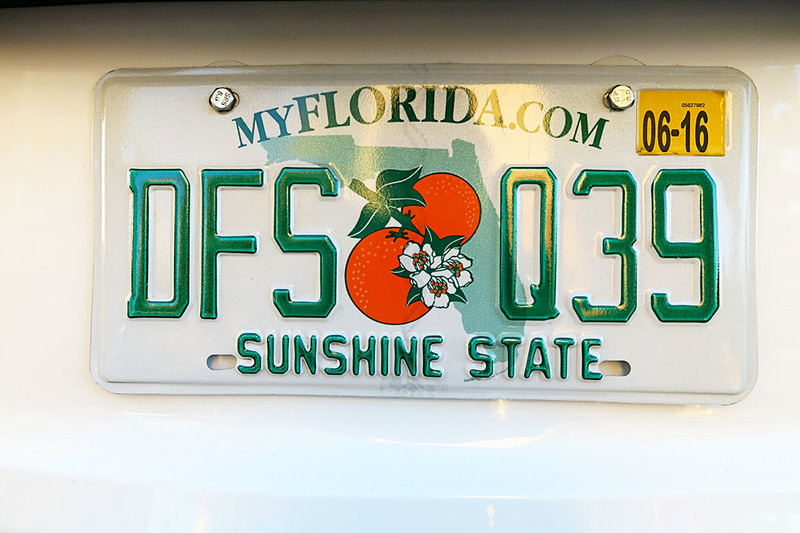 Such tourists, we had to take a photo of the fact the number plate on our hire car said the Sunshine State! And it certainly wasn’t wrong, the weather was gorgeous when we arrived late afternoon. The hotel we were staying at was the Lake Buena Vista Resort Village and Spa. On approaching the hotel we could see that we were literally just a few miles from Disneyworld which we were thrilled about. Our first impressions of the hotel were just how tall it was, it is split into four blocks and we were in block four which was above reception and also housed the spa as well. 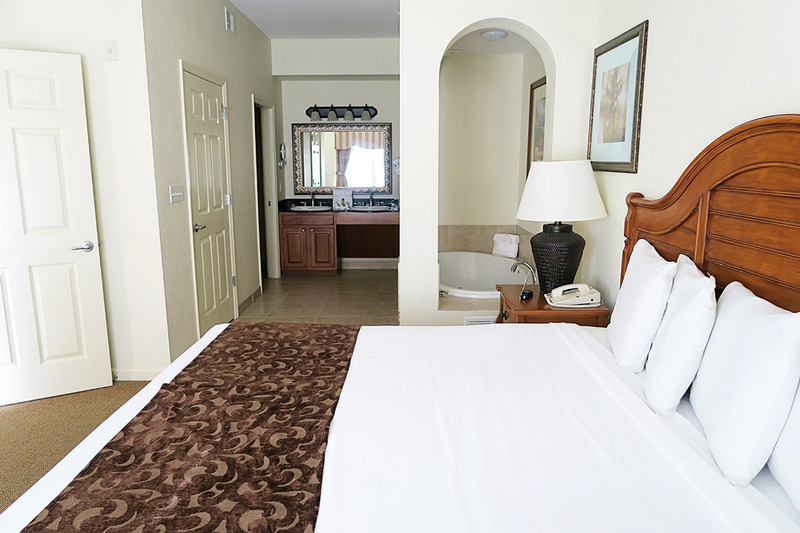 The resort is technically self catering but set out in hotel room style. This was definitely the best option for us as there is no way we would have wanted to eat at the hotel with all the delicious food available in and around Orlando. The staff were super friendly on check in and gave the girls a Mickey Mouse lolly- we definitely had arrived in Florida and sweet stuff and Disney would definitely be the highlights of the week! 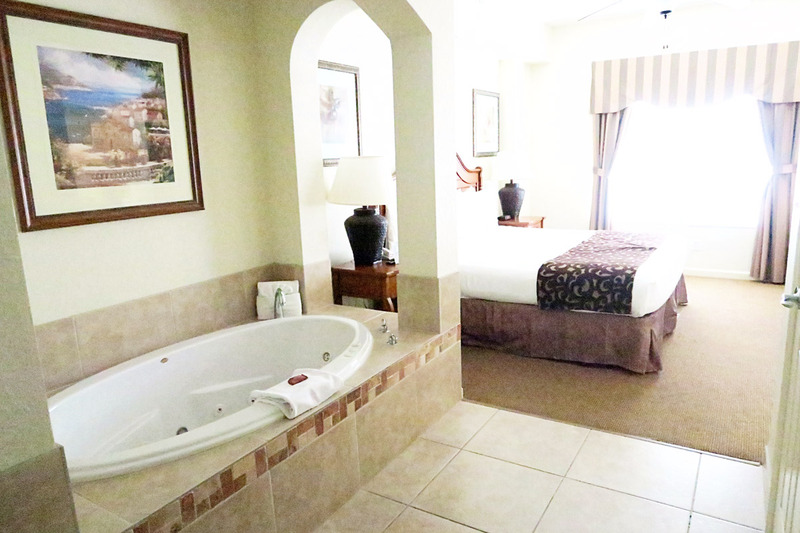 We were amazed when we arrived in our room- a two bedroom suite. It was absolutely huge. You entered into a huge lounge area with a glass table and full sized kitchen area with washing machine and massive fridge and freezer, as well as a comfy sofa area as well. The bed in the master bedroom was absolutely huge and ridiculously comfy. We loved the little card we were left with a note saying they hope we enjoyed our stay and our American treats. 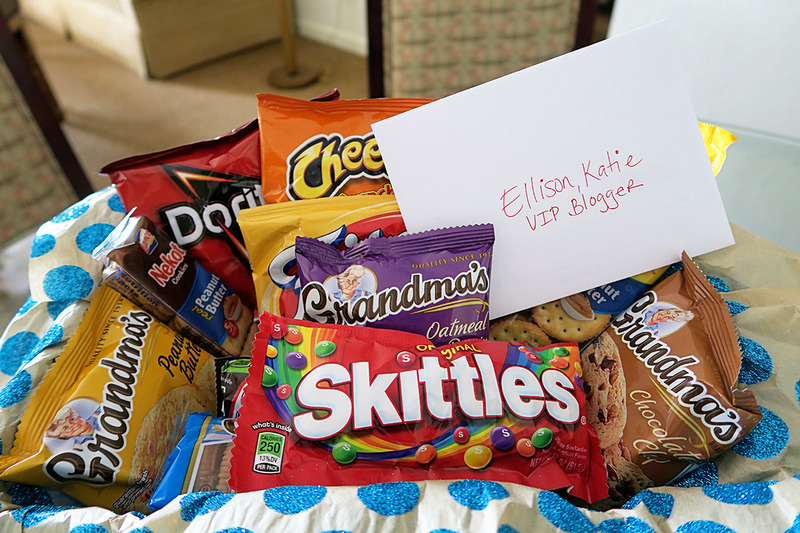 Mads is obsessed with watching You Tube and was so excited about the ‘American candy!’ It is probably the first and last time I will ever be called a VIP- my husband joked that they must have got the wrong room! This photo is a little grainy as the light was rapidly going by this point, but I was super excited about the massive bath in our room. There was also a separate bathroom for the girls on the other side of our suite by their room. The girls loved the bubbles in our bath and the fact it had colourful lights in it. 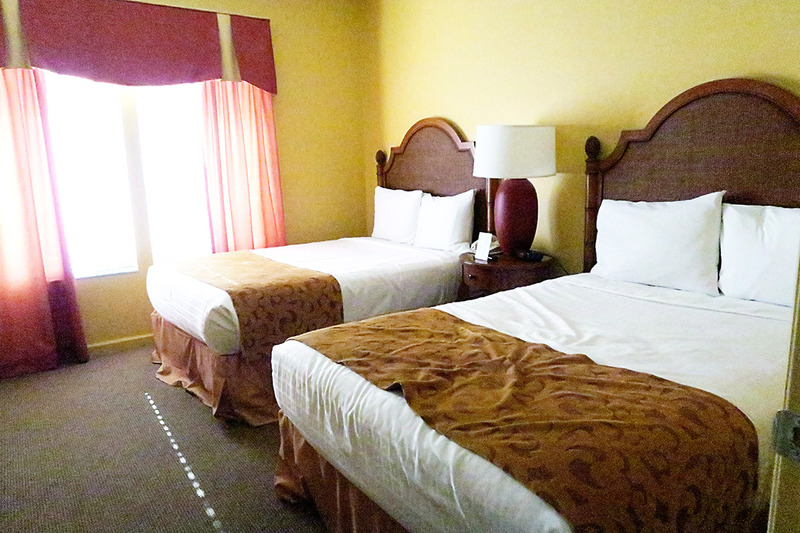 Their room was also big and with two big comfy double beds. As we were on holiday we let them sleep together in the same bed, but they were so tired after busy days that most nights we carried them up to our room already asleep! Our first evening was spent getting take out pizza at the very handy Pizza Hut Express in the hotel’s grocery shop (they also have an Irish bar too) as we were all so shattered from our long journey. We woke up on Saturday morning and sadly Mads was slightly under the weather which was just typical. So we decided to have a chill out day. 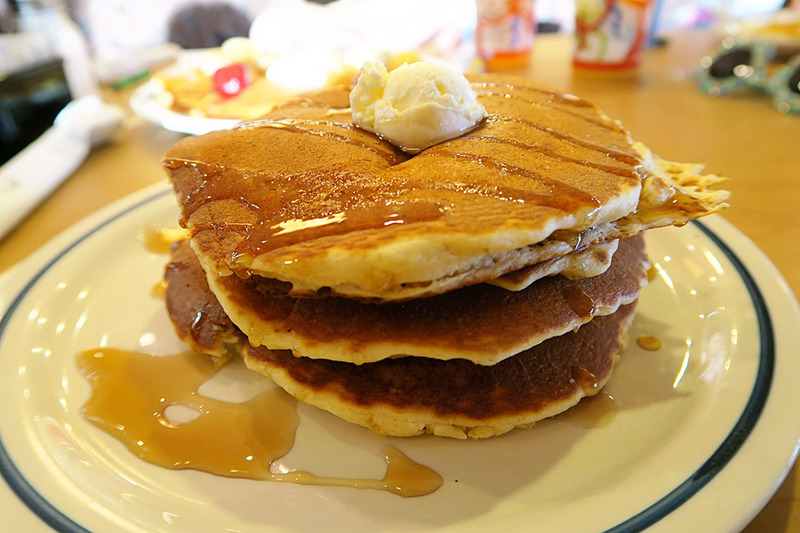 We headed off out to breakfast and there was only one place we were going to go- IHOP. 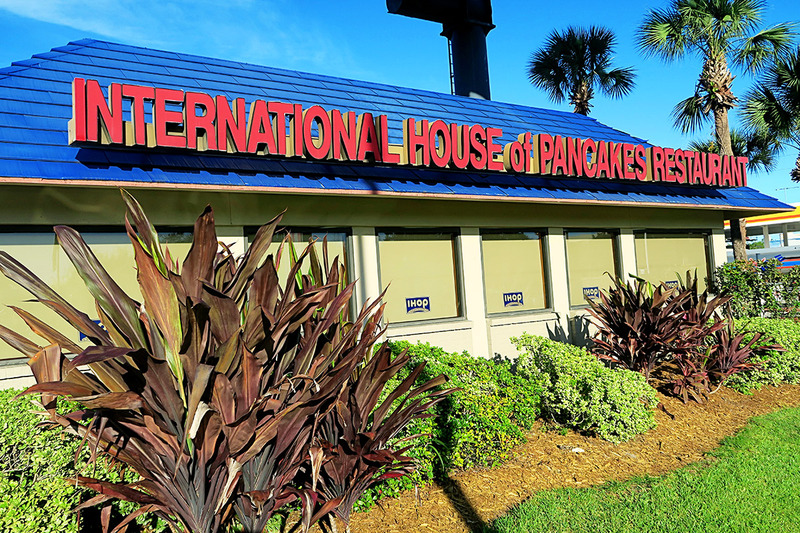 Although just a chain that is everywhere, I have always wanted to go to one as our family are huge pancake fans. It was definitely the perfect treat for the first day of our holiday. 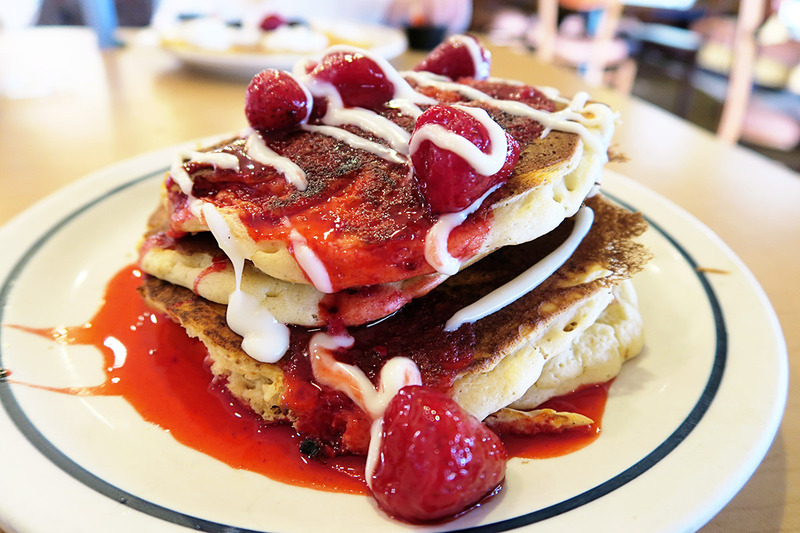 Mr E had the raspberry and white chocolate pancakes which he said were delicious. I had the original buttermilk pancakes which were just so yummy, while the girls had make a face scary pancakes as it was Halloween week. After our breakfast we headed back to the hotel to have a lazy morning and afternoon by the pool. 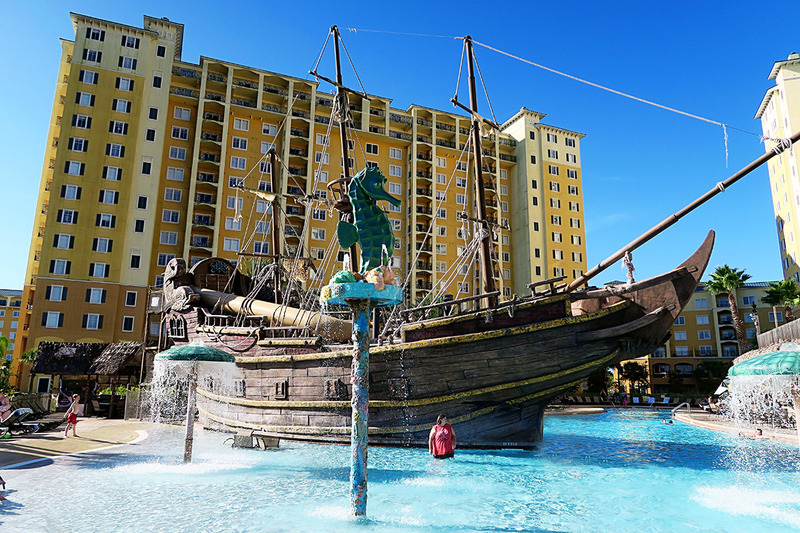 The girls squealed with delight when they saw the massive pirate ship in the pool. There are two pools but as this one was nearest to our block we didn’t actually check out the other one. Happy girls splashing away- they literally would live in a pool if they could, especially Mads. There was also a lovely warm jacuzzi pool as well as a slide on the other side of the pirate ship. We spent a lovely few hours chilling in the warm Florida sunshine. 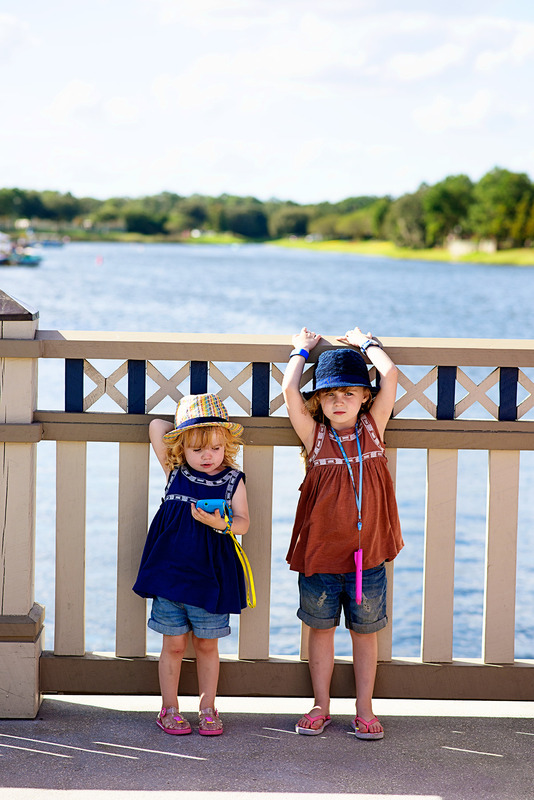 Posing by the big lake at Disney Springs, the whole of the area is immaculate and beautifully landscaped. The phones they are wearing round their necks are a present from Grandma before they left- one is Frozen and one is a Minion and they play all sorts of utterly bizarre sounds- I think she got them off eBay for about four pounds each but they are honestly their favourite toys! I don’t know what it is about going away, maybe it is spending quality time together as a family which we don’t always do at home, free from distractions such as phones and television, but this little one seems to grow up and change so much in just a week. 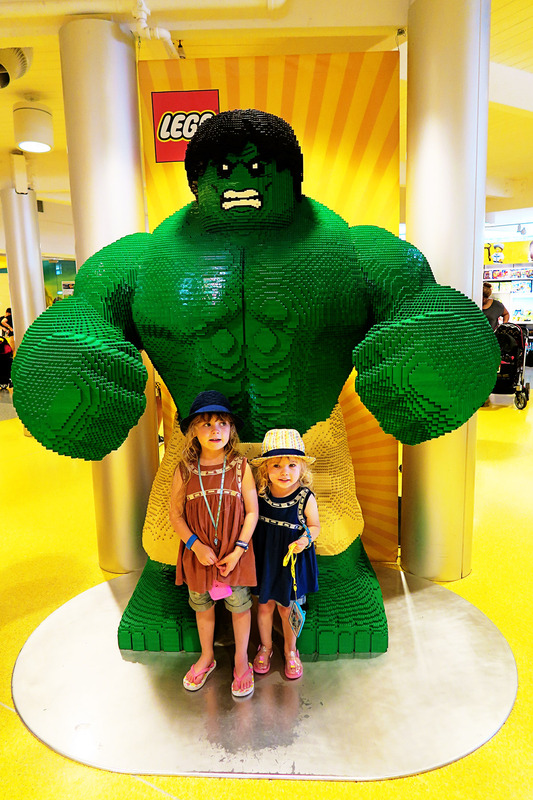 After wandering around in the afternoon sunshine we headed to the one place the girls were so excited to visit- The Lego Shop. 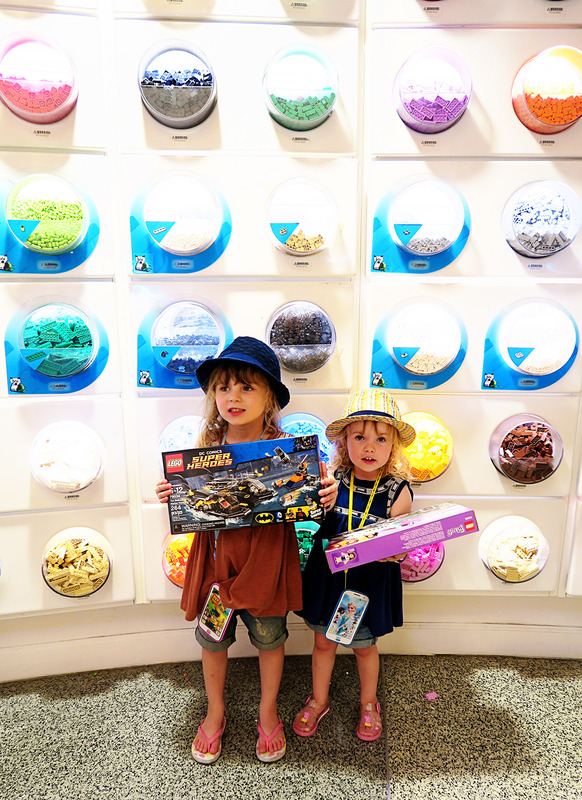 They were in their absolute element walking round looking at everything, they are huge Lego fans. There is also a covered outside area where you can play with all sorts of lego, but as you can imagine it was completely crazy. The girls were over the moon when we said they could pick a present each as an extra special treat for being on holiday. Here they are posing with their choices and they were so good and didn’t complain that we wouldn’t let them open them until we were back in the UK. 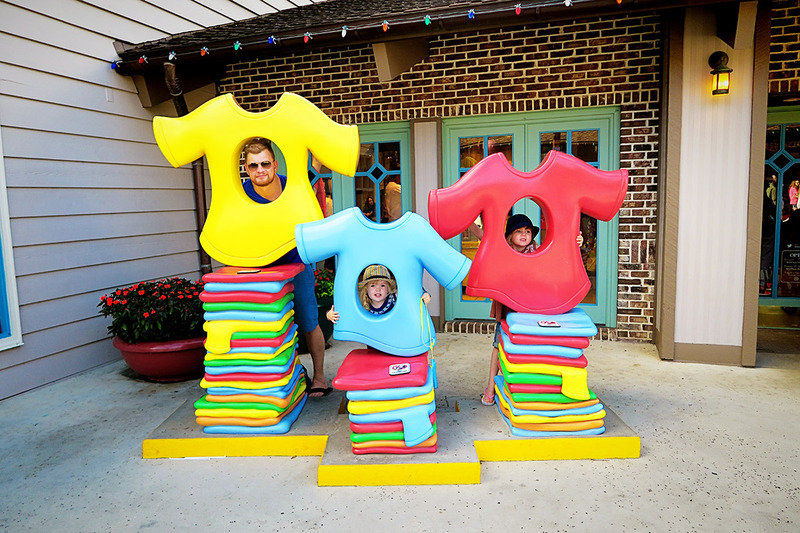 The whole of Orlando is so geared towards families, wherever you go there are photo opportunities and fun interactive things for children to do. My littlest lady hurt her knee so much on holiday, she just kept falling on it and really hurting it, I think it will leave a little scar bless her. 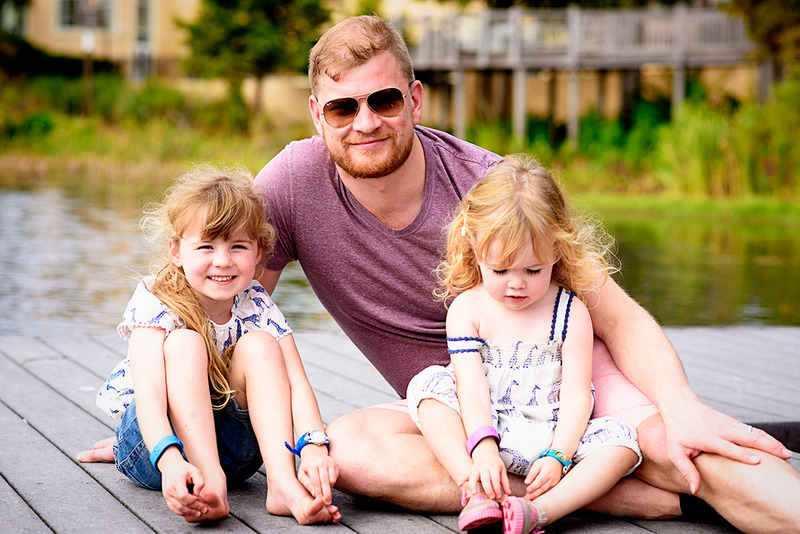 But I love this photo of my three, he really is the best Daddy in the world. 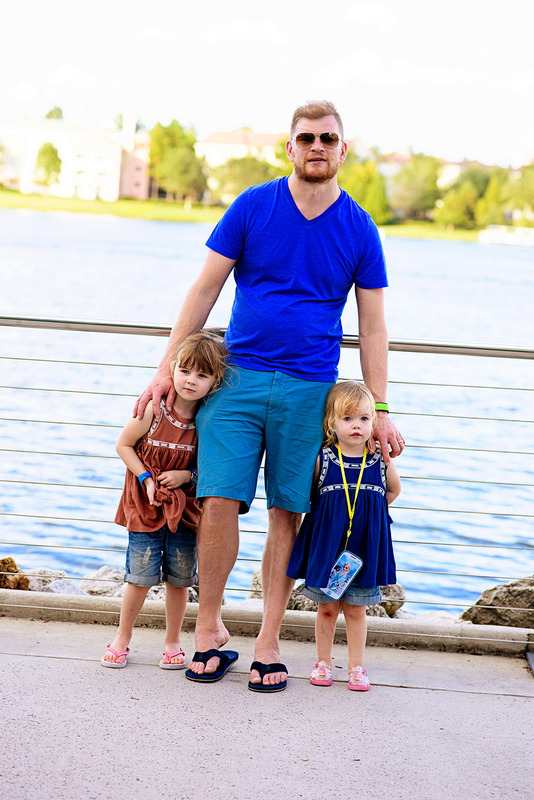 We stayed at Disney Springs for a good couple of hours, before it was time to go back home for another early night as we were all still tired from the flight the previous day. Sunday was another quiet day before the mayhem of Disney began the following day. When we go away, while we love the tourist areas, we also love to go off the beaten track a little. We decided to head to Winter Park, which is an Orange County city north of Orlando, approx about twenty miles away. 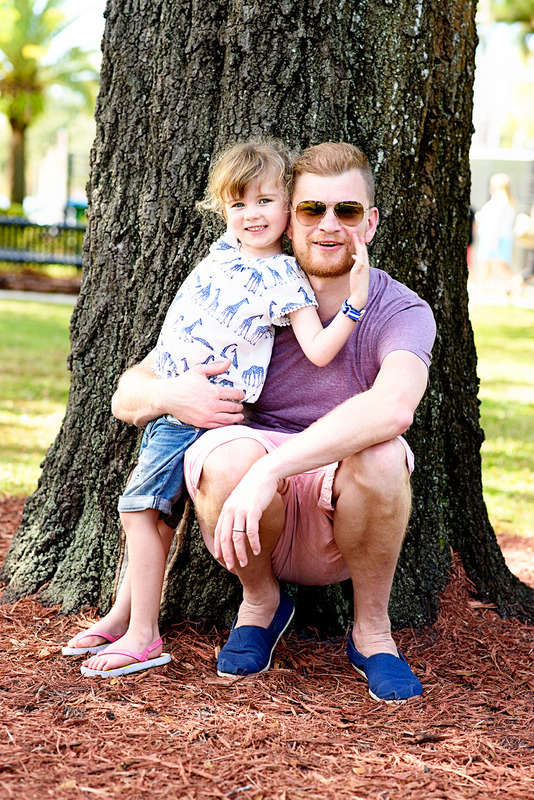 It is a beautiful place, made up of seventy parks which hold events throughout the year and also a glorious little area of shops and restaurants, with people sat outside enjoying a drink or some food in the warm Florida sunshine. First stop was Boggy Creek, a huge lake. 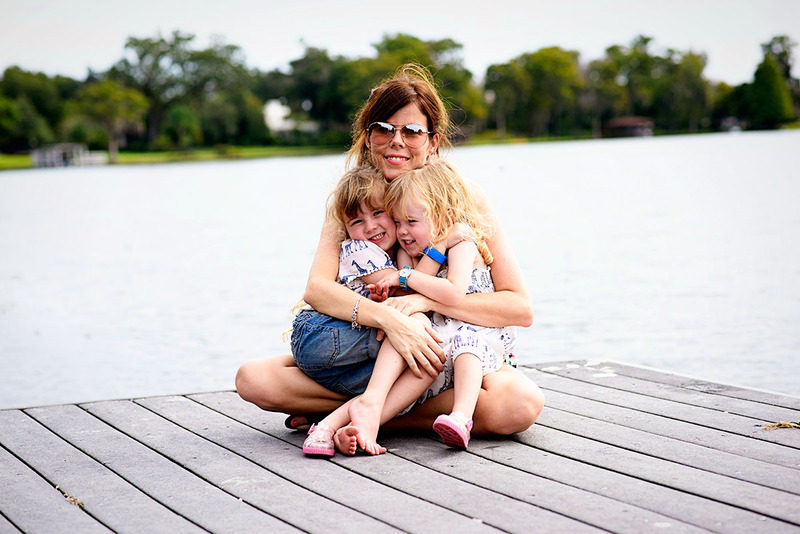 We found a little dock to sit on and watch the boats and admire the gorgeous huge homes that were situated on the lake. I love this photo of these two. And this one too. 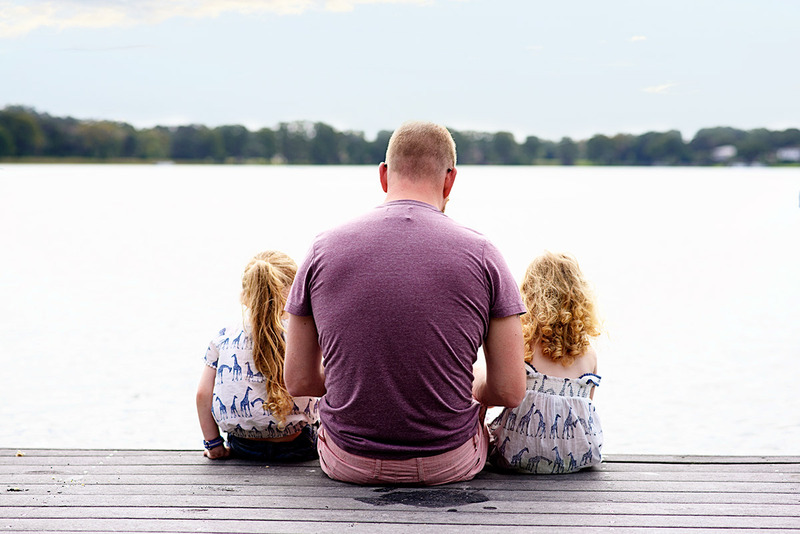 While we love being busy on holiday, I think especially with young children it is important to relax and take some time out. 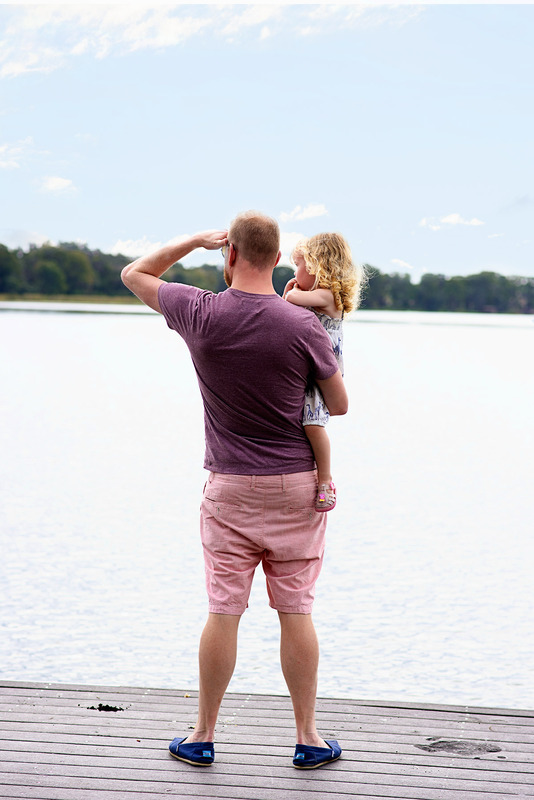 We want our girls to appreciate the beauty of a place not just the attractions. My little family. I truly cannot thank Thomson enough for working with us on this trip to Florida. I know it is a two way relationship but they really made our dreams come true. I had to pinch myself on so many occasions and I am incredibly grateful for giving us the trip of a lifetime. I love this photo of myself and my girls. Sitting on the dock of the bay. After a trip to the lake we headed into the little town itself and wandered around and got a huge ice cream from the ice cream parlour. We stumbled across a park that was hosting a pet halloween costume contest which was perhaps the most surreal and bizarre thing we have ever seen, so we made like the locals and sat in the park and took in the atmosphere. I love this photo of my sisters. 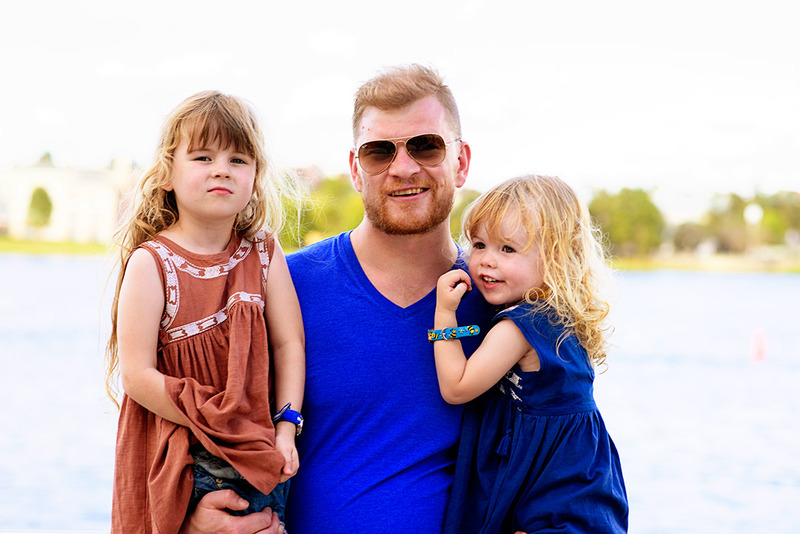 After our trip to Winter Park we headed over to see some friends who live in Orlando. Pete is one of our old friends from our Leeds days and he moved to Orlando a few years ago with his wife who is from here. It was lovely to catch up with them and see their home. Then we headed back to our hotel, freshened up and got ready to go out for dinner. Here they are cuddling their baby brother or sister. I feel very thankful that we got to experience this holiday as a four and have such a special time before their world changes next year. 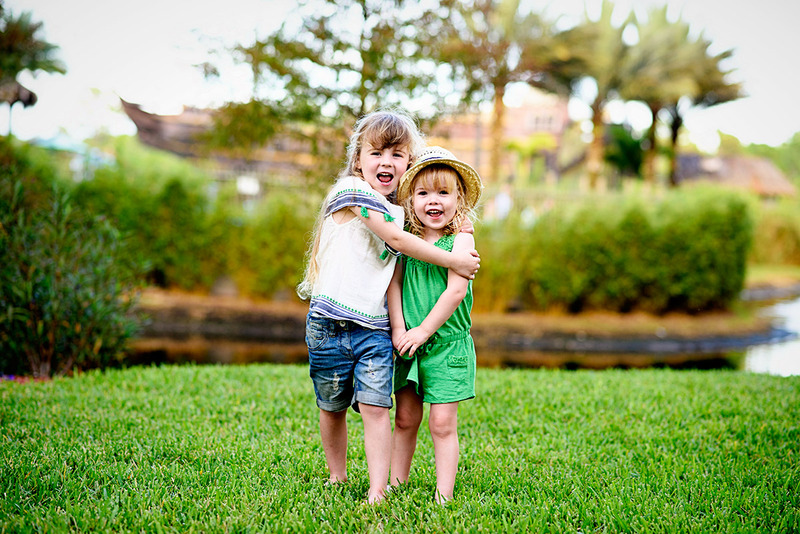 I love this photo of them- they were so well behaved all holiday, although of course we had the odd tired meltdown. 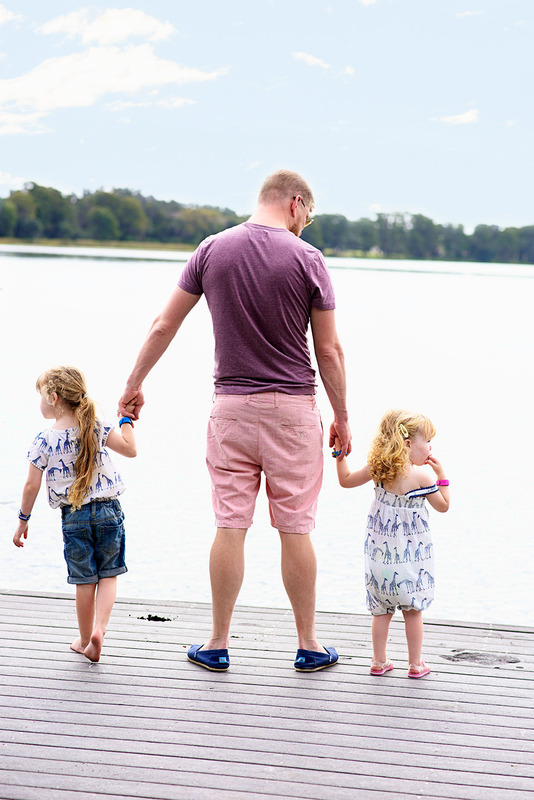 I must admit I was nervous as I wondered if they were too young to take to somewhere so frantic and busy, plus everyone has an opinion on the age you should take children to Disney, but I thought that at 4 (nearly 5) and 2 (3 in February) they were at the perfect age. They were young enough to completely believe the magic and it was amazing watching them staring at things in awe all holiday. Another place I wanted to try out for dinner was the Cheesecake Factory (it is at the Mall of Millennia) and I completely recommend it. It does huge portions of delicious food like burgers and then dessert is one of their huge range of cheesecakes- they were incredible, although we were all so full that we had to get the cheesecake to go. The girls were so tired at the end of our days that they would fall asleep wherever we were. Bless them! 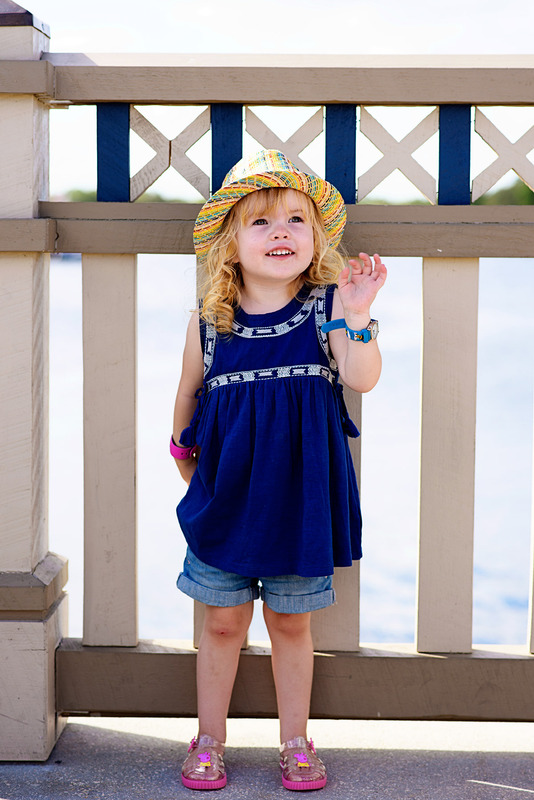 Monday was the day we had all been waiting for- we were off to Disneyworld, to their main park Magic Kingdom. I am going to do a specific Disney post with hints and tips as I just have lots of photos, but quite simply it was everything I had imagined since I was a little girl and more. We arrived into the mayhem that was Magic Kingdom early and it was already heaving. As we walked into the park and I saw the castle for the first time, I am not ashamed to admit that I got tears in my eyes (the first of many that day!). It really was a dream come true for us to be there and the emotions just got the better of me I think. As soon as we arrived we got one of the photographers to take a photo of us with the iconic castle in the background. I think you can tell from our faces just how excited we were. The parks were decorated for Halloween and there was beautiful autumn colours and pumpkins everywhere. I will treasure this photo of my little family. I had been nervous beforehand that Magic Kingdom wouldn’t live up to our expectations or that in the day and a half we were there we wouldn’t get a lot done. But actually we got loads done which I will talk about in another post. The main highlight of our day was meeting the girls heroes, this was incredible and we met so many characters which I was delighted about. 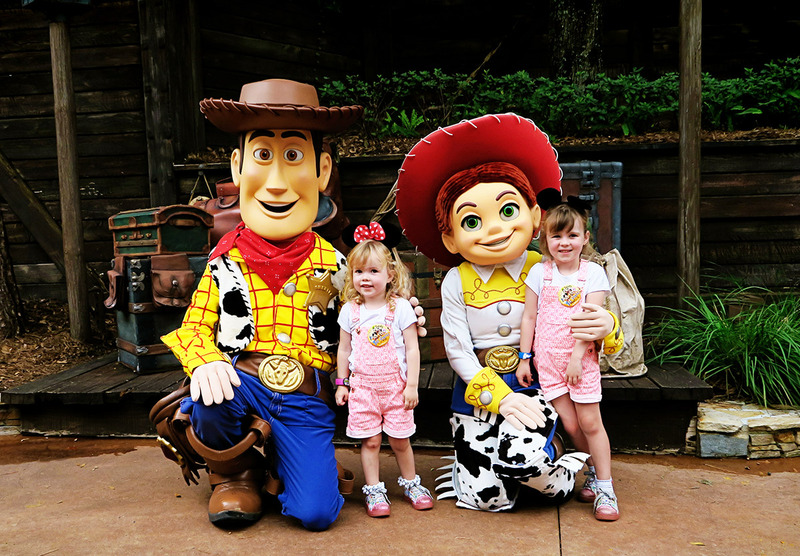 Here they are meeting Woody and Jessie, I truly will never forget the way they ran up to them and the look of awe on their little faces as they cuddled up to them all. It was utterly incredible to witness. I was worried the girls would be shattered at the end of the day but we managed an awfully long day. We got to the park at 8am and didn’t leave until gone 11pm at night. LL fell asleep but woke up just in time for the highlight of the Disney day- the Wishes firework show by Cinderella’s castle. I have dreamt of watching them since I was little and they didn’t disappoint- as the narrater Jiminy Cricket talked of wishes coming true, all to the beautiful backdrop of fireworks, I couldn’t help but yet again get tears in my eyes. It wasn’t just me this time though, looking around there were lots of people who were getting emotional. We live in a horrible world at times and Disney truly is the ultimate escapism from every day life. It was one of the most special experiences I have had with my little family so far. NB: We were invited on this trip of a lifetime by Thomson Holidays, although all words and opinions are entirely my own. All our trips and itinerary were planned by us. Gorgeous video, Katie! Love LL with Rapunzel! Oh Katie these are wonderful pictures and it all sounds truly AMAZING!! I cried a little reading it at how excited you must have been and how beautiful the trip was. What an opportunity indeed, something to talk of and remember for a very long time! 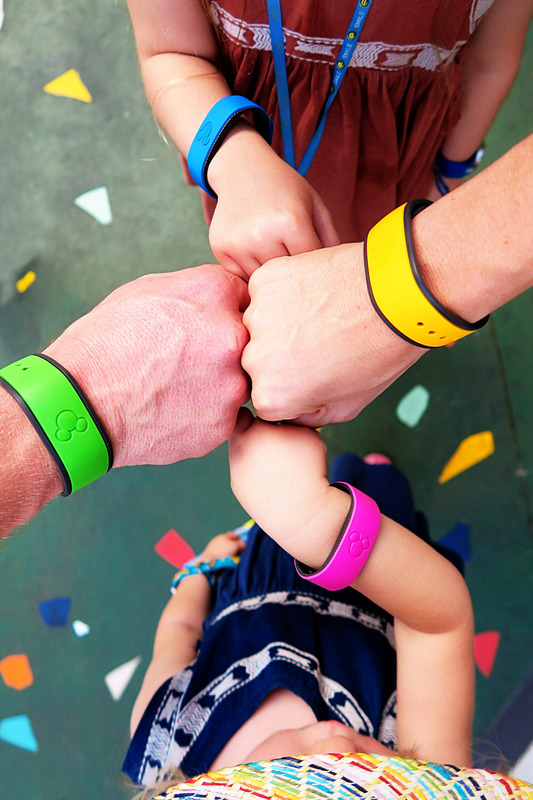 I love the idea of magic bands. Disneyland California are obviously a bit behind the times as we had standard paper tickets and fast passes. What with all the other things you have to carry at a theme park, much easier to have your hands free but still have it easily accesible on your wrist whenever you need to pay for something / enter the park / go on a ride. Also, I need that bath in my life. Erm, I totally didn’t cry reading the bit about the fireworks… honest *sniff sniff*. Loving the pics and video. Florida is my favourite place in the whole world and I haven’t been since 2008 ???? We have taken the boys to Eurodisney, but Orlando is on another level! 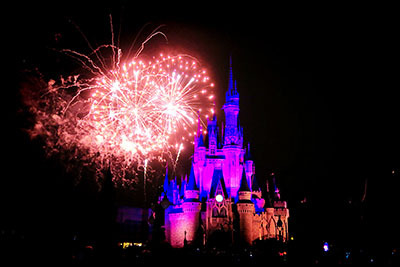 I also cry whenever I see the Disney castle and during the fireworks! (and also during the parades weirdly) ???? This is so lovely to read, and all the photos are truly beautiful! I have been to Orlando many times as a child and honestly the magic never leaves, it’s still some of my best memories. Oh Katie this is lovely and what a magical experience you all had together. I think you are so right a little down time and showing the beauty of the place not just the attractions are so important. Love the video and post full of glorious photos! Beautiful family vacation! Awwww, Katie, it looks amazing. Wow! There must have been so much to take in. My mum and dad took my brothers while I was at uni so I missed out on going. It would be a dream to take the boys, one day. We have friends who live in Texas so we’ve already discussed a potential reunion in Florida. One day! Amazing photos. It really is such a magical place to visit. I want to visit the Cheesecake factory on our next trip next year. It’s such an amazing and beautiful place to visit. That magic bands are cool. 😀 just loving this magical post!